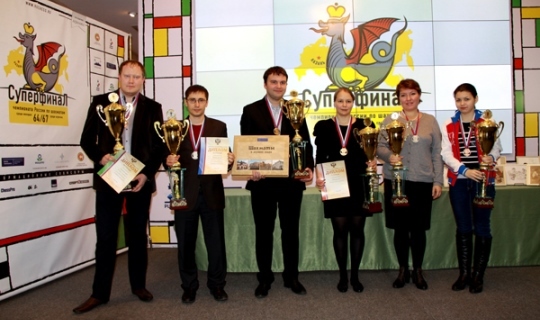 The Russian Chess Championship Super Final, the 67th for men and the 64th for women, took place from 27 November till 8 December in the city of Kazan, in a branch of the State Museum of Fine Arts of the Republic of Tatarstan (the Khazine Gallery). The Super Final is the main individual competition in the Russian chess calendar: it determines the country’s strongest male and female chess player. The tournament is a follow-up of the Chess in Museums project, an international programme run by the Russian Chess Federation (RCF) in conjunction with the Elena and Gennady Timchenko Charitable Foundation. The Super Final’s participants were playing in a hall hosting an exposition of paintings by Nicolai Fechin, a famous artist born in Kazan. The works exhibited in the hall include the famous pictures Slaughterhouse and Showering with Water. Students of the Fechin Kazan Art School are attending the tournament every day to do sketches of the players. When the competition finishes, the jury will award prizes to the authors of the best works. 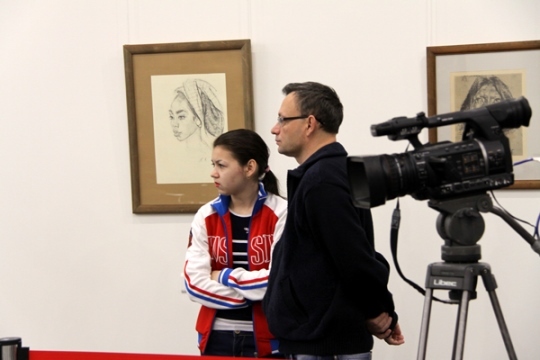 The closure of the 67th Men’s Russian Chess Championship Superfinal and the 64th Women’s Russian Chess Championship was held at a branch of the Tatarstan State Museum of Fine Arts (the Khazine Gallery) on 7th December. Ten male and ten female players waged an arduous battle of nine rounds to identify the strongest. In the final round of the men’s tournament, Nikita Vitiugov destroyed Ian Nepomniachtchi with Black. The opponents played out a complex opening line in which Black was in a very promising position. White failed to castle and Black launched a powerful central attack. Vitiugov won major material and soon drove the point home. Peter Svidler outplayed Vadim Zvjaginsev in a long duel. The latter sacrificed a pawn in the middlegame but did not obtain any serious compensation. The extra pawn had its say in the endgame and Peter finished the tournament on a winning note. 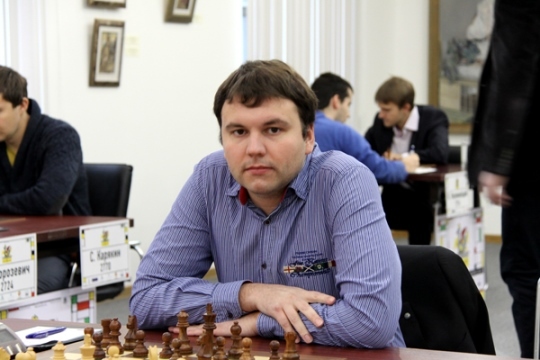 The games B. Grachev – I. Lysyj, D. Khismatullin – D. Jakovenko and A. Morozevich – S. Karjakin ended in draws. 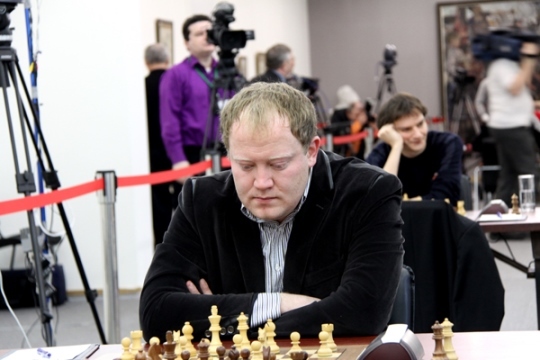 Igor Lysyj became the Russian Champion with 5.5 points in 9 games. 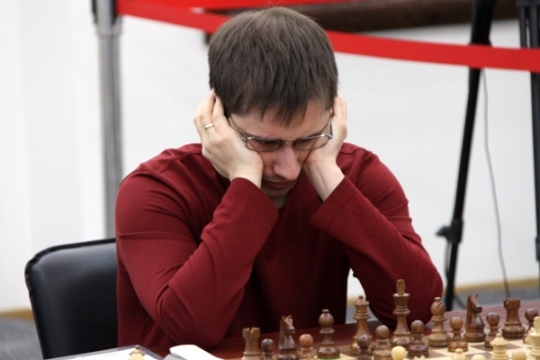 The silver medalist was Dmitry Jakovenko, who lagged behind the winner by half a point. Denis Khismatullin took third place, gaining 4.5 points, like four other participants, but staying ahead of them in terms of additional indicators. 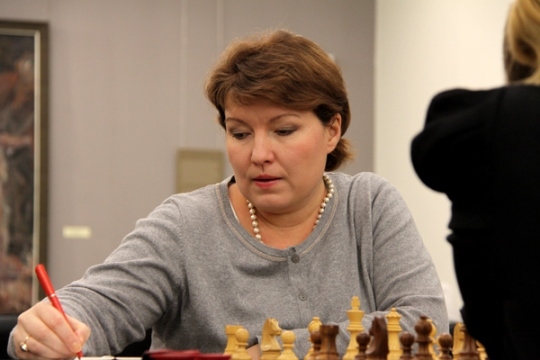 In the women’s tournament, it all boiled down to one game: the match between the leaders Alisa Galliamova and Valentina Gunina, which ended in the latter’s favour. Valentina sacrificed a pawn in the opening and obtained compensation. During time trouble, the game swung like a pendulum and, at one point, White had a decisive edge. But then Galliamova made a blunder and the advantage swung back to Black. Valentina Gunina brought the game to a ruthless conclusion and became the Russian Champion for the second time in a row. Alisa Galliamova won the silver. The round also saw a sensational defeat of Alexandra Kosteniuk, playing Black, by Superfinal first-timer Oksana Gritsayeva. Anastasia Bodnaruk, who had also done very badly in the tournament, outplayed Olga Girya, who had been among the leaders for nearly the entire distance. Olga made a mistake in a better endgame and Anastasia achieved a win. In a lengthy tug-of-war, Alina Kashlinskaya gradually outsmarted Natalija Pogonina with Black. Ekaterina Kovalevskaya and Aleksandra Goriachkina drew. The 16-year-old Aleksandra took third place, overcoming Olga Girya in terms of additional indicators. 1. I. Lysyj – 5.5; 2. D. Jakovenko – 5; 3-7. D. Khismatullin, I. Nepomniachtchi, P. Svidler, A. Morozevich, N. Vitiugov – 4.5; 8-10. V. Zvjaginsev, B. Grachev, S. Karjakin – 4. 1. V. Gunina – 7; 2. A. Galliamova – 6; 3-4. A. Goriachkina, O. Girya – 5.5; 5. A. Kashlinskaya – 5; 6-7. E. Kovalevskaya, A. Kosteniuk – 4.5; 8-9. A. Bodnaruk, N. Pogonina – 2.5; 10. O. Gritsayeva – 2. The Superfinal’s closing ceremony was held at the Khazine Gallery on the same day. The participants received congratulations and awards from Vladimir Leonov, Tatarstan Minister of Youth Affairs and Sports; Igor Baradachev, Deputy General Director of the Elena and Gennady Timchenko Charitable Foundation; Gennady Zakharov, President of the Tatarstan Chess Federation; and Mark Glukhovsky, Chairman of the Management Board of the Russian Chess Federation. 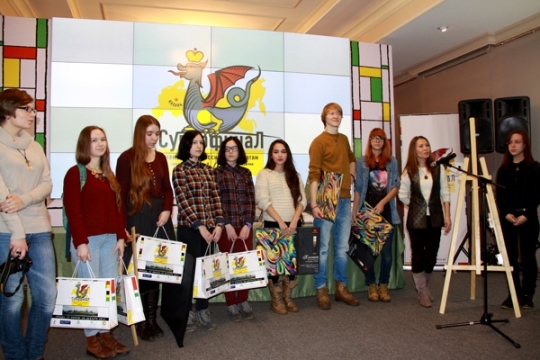 Prizes were also awarded to students of the Kazan Art School, who had been sketching the players during the event. Ulyana Babakayeva won the third-place prize, whereas the second prize went to Ksenia Vlasova and the first to Elvina Sabirova. Andrey Filatov, President of the Russian Chess Federation, summed up the event: “The Kazan Superfinal has been a real feast for both participants and fans and has yet again showcased Russia’s outstanding chess talent. I congratulate with all my heart Russian Champions Igor Lysyj and Valentina Gunina on this great victory. On behalf of the Russian Chess Federation, I would like to thank the first President of the Republic of Tatarstan, head of the Organising Committee of the Superfinal Mintimer Shaimiev, thanks to whose personal involvement the competition was held at the highest standard; head of the Republic of Tatarstan Rustam Minnikhanov and Mayor of Kazan Ilsur Metshin for the opportunity to hold the tournament at one of Russia’s best regional museums; and our loyal partner ‒ the Elena and Gennady Timchenko Charitable Foundation. The prize money is 7 million roubles, 5 million for the men and 2 million for the women. The chief referee is Anatoly Bykhovsky. Chess is a special game that is closely linked not only with sport, but also with history and culture. The Chess in Museums programme aims to make this link evident to everyone. Bringing sport and culture together, the organisers have jointly come up with an original idea of holding chess tournaments in the best museums of Russia and the world. Akvanika has provided mineral water for the tournament’s participants. The Super Final’s media partners are the ITAR-TASS news agency, the Sport-Express newspaper, the ChessPro portal, and the 64  Chess Review magazine. Chess in Museums is an international programme run by the Russian Chess Foundation (RCF) jointly with the Elena and Gennady Timchenko Charitable Foundation (the Timchenko Foundation). 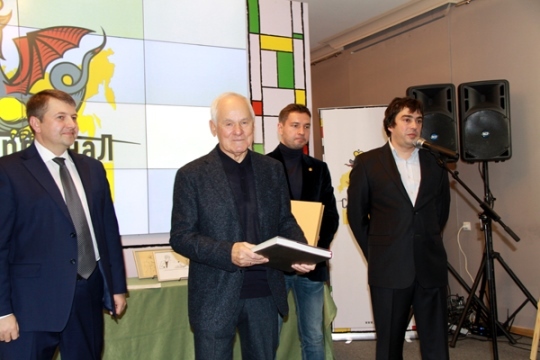 The idea to hold chess events in major cultural centres was implemented for the first time during a world chess championship match, which was held in 2012 in the Tretyakov Gallery under the initiative of Andrei Filatov and Gennady Timchenko. In spring 2013, the RCF, jointly with the Timchenko Foundation, held the Alekhine Memorial super tournament in the Louvre and the Russian Museum. This was followed by the Russian Chess Championship Super Final held in Nizhny Novgorod museums in autumn of the same year. The Russian Chess Federation (RCF) is a non-government, not-for-profit organisation bringing together individuals as well as chess federations from various Russian republics, areas, regions, cities of federal significance and autonomous areas and districts. Founded on 15 February 1992, the RCF seeks to develop and promote chess in the Russian Federation. The federation organises the annual Russian children’s tournament among schools White Rook, the Russian Championship and other chess competitions. Since 2012, the Chess in Museums project has been held in Russian under the RCF’s initiative. For over 20 years, the family of Elena and Gennady Timchenko has been providing charity both in Russia and abroad. To ensure that philanthropy makes a difference in the long term, a charitable foundation was set up in Moscow in late 2010, named Ladoga until the end of August 2013. Today it is named the Elena and Gennady Timchenko Charitable Foundation (Timchenko Foundation) and comprises all the areas of family charity in its portfolio. The Timchenko Foundation focuses on promoting active longevity, developing sports and culture and aiding families and children. These strategic initiatives aim to provide a systemic solution to Russian social problems.